As the Quinnipiac men’s basketball practice comes to a close, you may see one coach off to the side shooting free throws with the ball boys and fooling around with some of the guys on the team. Other days he will be entertaining the team by standing on the concourse behind the seats in the gym and making one-handed shots from 50 feet out. This man is assistant coach Scott Burrell, a basketball legend in Connecticut. University of Connecticut fans remember him as part of the team that returned UConn to the national stage in college basketball in the early ‘90s. Others know him as a member of the 1998 Chicago Bulls championship team. Coming to Quinnipiac, Burrell was back where his career began. Burrell grew up in Hamden and used to work out on-campus when he was a teenager. A two-sport athlete at Hamden High School, he was drafted in the first round by the Seattle Mariners to play baseball. Instead he went to UConn, where he was once again drafted, this time by the Toronto Blue Jays, and was still playing two sports. Burrell felt that playing two sports held him back in excelling in either one and decided he had to choose between the two. Burrell established himself as an NCAA legend during his career at UConn, where he helped his team to its first No. 1 seed in the NCAA Tournament. “The main accomplishment I remember was when we beat Clemson at the buzzer in the NCAA Tournament,” Burrell said. With one second left in the game, Burrell inbounded the ball to Tate George, who scored at the buzzer to send UConn to the Elite Eight. At the end of his collegiate career, Burrell compiled quite the résumé. He became the first player in NCAA Division I history to have 1,500 points, 750 rebounds, 300 steals and 275 assists. Burrell was drafted in the first round by the Charlotte Hornets in 1993. He joined stars such as Alonzo Mourning, Larry Johnson, Tyrone “Muggsy” Bogues and Dell Curry. He spent four years with the Hornets and half a year with the Golden State Warriors. Before the 1998 season, Burrell was traded to the Chicago Bulls. This gave him the chance to play for one of the greatest NBA teams of all time, and complete a dynasty that won six championships in eight years. The Bulls went 62-20 and defeated the Utah Jazz in six games in the 1998 NBA Finals. Burrell was on the court for every game during the Finals that year, including a 10-point performance in a Game 3 victory. Playing with teammates such as Michael Jordan and Scottie Pippen, Burrell learned a lot and began to truly appreciate how great those players were. After eight seasons in the NBA, Burrell wanted to become a coach. He started out coaching in the NBA Developmental League for the Colorado 14ers. 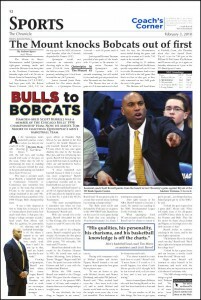 When Quinnipiac hired UConn assistant coach Tom Moore, Burrell saw his chance to return to his hometown and coach. Senior forward James Feldeine also said that having Burrell on the staff has been beneficial to him and the team. “He just teaches us all the little things, like how to get open, get by people…just things that have helped people get by in the NBA,” he said. Burrell wishes to continue coaching in the future, and he has even higher aspirations. “I think he has a great future and can become a terrific coach down the road,” Moore said. Right now Burrell will continue to enjoy himself in his hometown and work with the Bobcats, who are in position to win a Northeast Conference title.